I have found that a high school math teacher has to be not only knowledgeable about the math and the standards to teach but also, a cheerleader. Many students come to us with a fixed mind sets, and they are “I am good at math”, or “I am not good at math”. More often than not, it is the latter statement. As my journey through becoming a teacher was a long and winding road, it seems appropriate that my Driving Question has also taken some twists and turns, similar to the long and winding road to the left or the sine functions above. It started out as,”How Can I Motivate the Unmotivated Students”, this was vague, so we narrowed it down to " How can a Growth Mindset Influence mathematics achievement?" and helping students develop a growth mindset about their math learning, or maths learning, as I prefer to state it. As I found out, there is an incredible amount of research and work done on growth mindset, which is wonderful, but I wanted to be more specific so now my driving question is " Can Infographics Increase Learning In a Trigonometry Unit in a Pre Calculus Math class?" 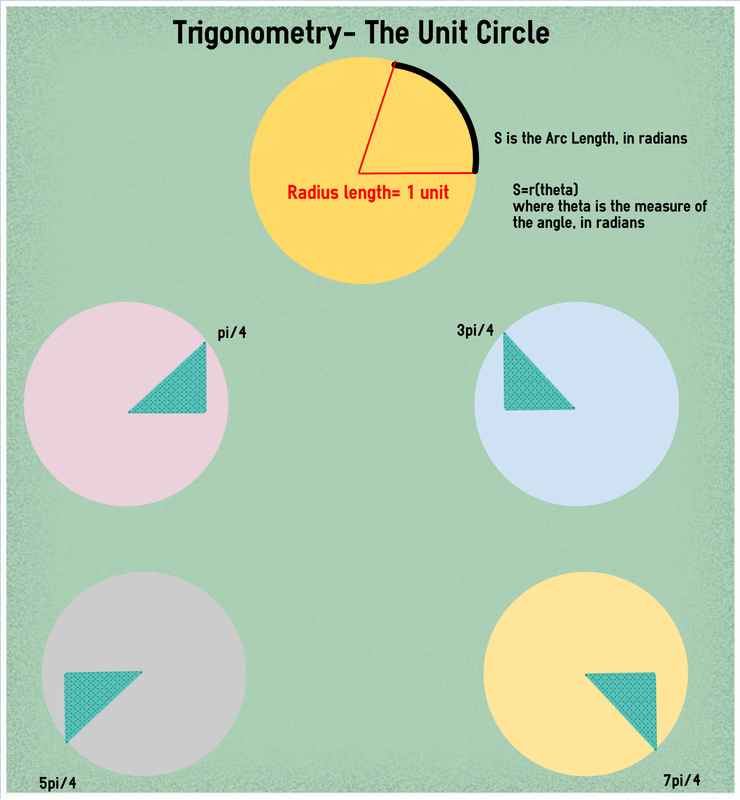 I decided to try using a tool that I learned about while in this program with Touro, Infographics, in a unit that is usually challenging for students learning Pre Calculus, Trigonometry. When we learned about visual presentations and created Infographics, I wanted to use these as a tool in my teaching. As a primarily visual learner myself, I tend to teach to visual learners, I use graphic organizers, flow charts, colored pens, and lots of pictures to illustrate the math concepts that I am teaching. When I earned my credential, many of my classes were focused on teaching ELL students and the strategies we learned have influenced my teaching as well. Infographics are certainly in line with these strategies. Less text, but making the text that is used, important. Creating not only a visual, but allowing the visual elements to tell the story, with symbols, illustrations and data, is very exciting for me. I want to create infographics for many of the ideas that I will be presenting to my students. When I searched with the phrase, "high school math infographics", I found many infographics that I can use, I feel like I can create one or 2 a year, and hopefully, build my infographic library. I have an idea to print out several and make it into a "gallery walk" activity- where students have to take notes on what they see, and then, after the walk, go back to their seats and answer some questions or have to match ideas to each graphic. I explored 3 different Infographics programs, Visme, Easel.ly, and Piktochart. All of them offer many more features when you purchase a subscription, but one can “explore” the basics with the free versions. My Computer Science students submitted an Infographic for part of their AP requirement, and at that time, I had used Piktochart, so I advised them to use it. I did not want them to have to purchase a program. It was easy to learn and create what they wanted, within the limitations of the images. When I have used Piktochart and then gone back, there are helpful pop-ups with new features, such as the color choice changes. I was not happy with the bar graph that I made, it limited the text that could be displayed. For example, the title for the first set of Grades data is, “Math 2 Fall” and it only shows Math. The next one is Math 2 Spring, and it only shows Math- so the chart is unclear and there was not a way for me to change it. The Visme tutorials were very helpful and steps a person through the different functions of the program. Easel.ly is also easy to learn and work with but, like the others, the free versions are limited. They are all pretty similar, with their own images to use, and templates to work with. I chose Easel.ly to purchase for a year for no special reason. I think that they are all really similar, and that any of them can create a pretty good Infographic. When I signed up and paid for a year with Easel.ly, they sent me some introductory emails, one of which is an offer to have their designers create an Infographic for me. So I have submitted my ideas to them and will see what they come up with. I found that math ideas and symbols can be difficult to get graphics and symbols that we use, like Greek letters, so I am having to be creative with things, and have reached out to the Easel.ly support staff for help.